What are you reading this week and why? 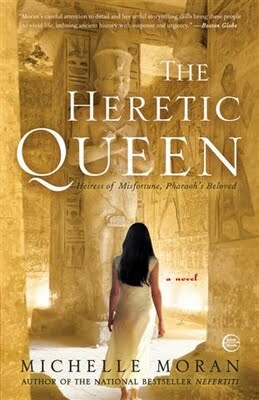 The Heretic Queen by Michelle Moran. I love history, and have always been captivated by ancient Egypt. Michelle has a stellar writer's voice. All of her books are solid, gripping, and leave me excited to read the next one. My own! As insanely hopeless as it sometimes feels, I know that it will eventually catch the right editor's eye. Besides that, Michelle Moran's newest book coming out, Lady Tussuad. I am incredibly excited to read it! I too love books about Eygpt! I'll have to add this to my to-read pile! I'll also add your book too! I'm a new follower stopping by via the blog hop! If you have time feel free to stop by and say hi! Hop-ing by and a new follower... I love everything about Egypt as well, hope you enjoy the book. Hopping through. I've heard a little bit about The Heretic queen. I'd like to read it. New to your blog and was checking it out! Have a wonderful day!